Americas Division of ABS. He is responsible for all operations of the American Bureau of Shipping in the Western Hemisphere. DNV he has held management positions for the company’s clas- sifi cation business in several countries including Korea and Japan. Management Code and Goal Based Standards for ship construc- tion. In 2003, he became member and he is currently Chairman of the IACS Council. He will keep this position until June 2014. 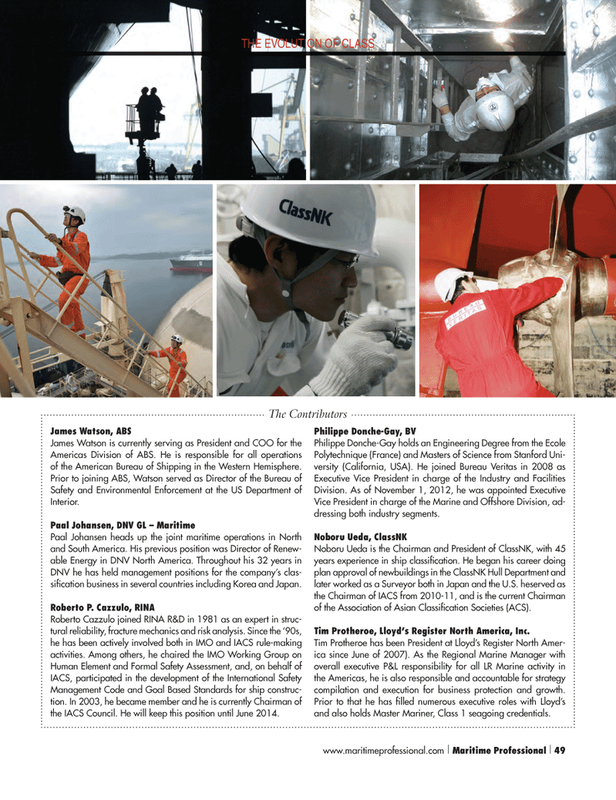 Vice President in charge of the Marine and Offshore Division, ad- dressing both industry segments. Noboru Ueda is the Chairman and President of ClassNK, with 45 years experience in ship classifi cation. He began his career doing plan approval of newbuildings in the ClassNK Hull Department and later worked as a Surveyor both in Japan and the U.S. heserved as the Chairman of IACS from 2010-11, and is the current Chairman of the Association of Asian Classifi cation Societies (ACS). Tim Protheroe, Lloyd’s Register North America, Inc.
Tim Protheroe has been President at Lloyd’s Register North Amer- ica since June of 2007). As the Regional Marine Manager with overall executive P&L responsibility for all LR Marine activity in the Americas, he is also responsible and accountable for strategy compilation and execution for business protection and growth. Prior to that he has fi lled numerous executive roles with Lloyd’s and also holds Master Mariner, Class 1 seagoing credentials.